AVForums reviewed the MRX 700 and gave it the "Best Buy" stamp of approval, comparing it to the "physique, poise and accuracy of a mid 80s Russian gymnast...where its grip and control of real world loudspeakers manifests itself in a very taught, textured delivery that has real - as in hi-fi levels of - detail and refinement." "With enough real world power to shake the room with whatever speakers you choose; it polishes this with a subtle and nuanced performance which is both deft and vice like in its grip. This transfers well to music, with an open and transparent reproduction that propels music along with enthusiasm and insight, eschewing the superficially more impressive, but ultimately less communicative reproduction of its peers." "That this ability is further heightened, rather than quashed by the use of the ARC room correction is, I feel, reason enough to push the MRX 700 to the top of your audition list. 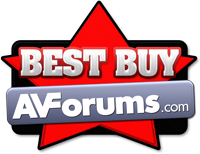 I've been continually impressed the subwoofer cousin of ARC (PBK) and hearing its effectiveness with all channels at such a low price point has only served to make me wonder why so many others get it so wrong." "There are two points that were very clear to me after my first, extended, thrashing of the MRX 700. The first is that if this is 'only' a 7x120W of amplifier, then somebody should tell Anthem their Watts are larger than the competitions. Okay, I only run 5.1, but as any visitors to Williams towers will confirm, the listening room is quite large and I'm prepared to fill it to the corners with sound and the MRX-700 was well up to the task, without losing it's composure." "It was during one of my music sessions that the second revelation hit me. For the first time ever, I preferred music with the EQ switched ON and I still can't believe I've just written that. Turn ARC on and the stereo soundstage increases slightly in size, tightens up in terms of focus, but because most of its doings are focused toward the bottom end of the range (I tended to set the EQ to an upper limit of 1kHz) the natural life and sparkle survived untouched." "Forget the spec sheets, get out and hear the MRX 700. There is no spec sheet for sheer class and the MRX 700 delivers it by the bucket." For more information on Anthem MRX receivers, click here!